I was looking for a particular circular knitting needle in my box of needles and stitch holders and stitch markers. It wasn’t there. I found it in my box of projects-in-progress, with about an inch and a half of forgotten yellow baby hat hanging from it. There are half-finished knitting projects all over my house. I debated over what to do. It was just an inch and a half of work, not representing much time at all. 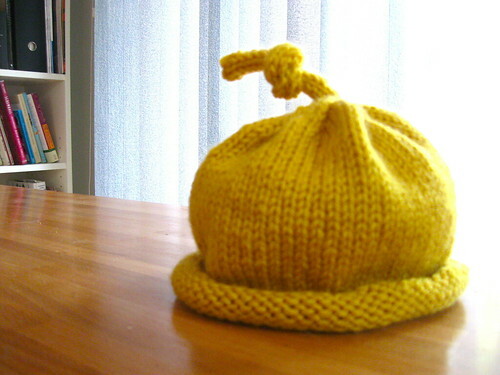 I could easily unravel the little hat brim, roll the mustard colored yarn back into its ball. Forget that I had ever started knitting this particular baby hat. (After all, I’d forgotten about it once already.) On the other hand, I’ve completed a surprisingly small number of projects in my five years as a knitter. Baby hats knit up quickly. I could just finish it. While I was still trying to decide what to do, I found myself picking up the needles, winding the yarn around my right hand. I could always stop, I decided, if finishing the hat didn’t seem right. But when I sit with my pattern and my needles in my lap, loneliness descends. I cannot knit without thinking of my great-grandmother. Most of my knitting supplies used to be hers. I wish she were here to teach me to knit, so I could move beyond scarves and baby hats. Her name was Irma. I have a picture of her holding my infant mother in a tiny frame by my bed. (For some reason, it’s one of the only family photos in the house.) She had her babies at home and raised four children. And at the end of her life, she was terribly depressed. The loneliness of being a point instead of a circle. sitting close by, showing me the way. not like a baby holds a spoon. You don’t need to pull so tight. That’s a lot of work for just one stitch. Lately I’ve been fighting off my own depression…It seems to be working, but a dull sadness comes through every now and then. I guess that would be loss. Which everyone tells me I need to acknowledge. But it feels strange mourning something that may have existed only in my mind (and perhaps not even there). I finished the baby hat. Knitting it felt strangely meditative. It was good to create something, to let my hands be hands for a while. I crave the connection—knitting, weaving, mending, bringing threads together, cloth into blankets, yarn into fabric—like I crave touch. As I worked, I tried to remember why I had started knitting this little hat in the first place. I hadn’t been pregnant at the time, although I’m sure I wanted to be. Maybe that was it: a little knit talisman. Something to put in my hope chest, if I had one.